With the price of meat soaring, I’m always looking for cheaper stuff. Go to the store early in the morning to find reduced meat that is about to expire in a day or two. There’s nothing wrong with it. That green in the left picture isn’t bad meat. Read on. I found some flank steak the other day. It’s usually tough and needs to be boiled. Who wants to boil meat for several hours in Kansas heat? I tried this new marinade. It really worked. Take a kiwi, cut it in half, and scoop out the fruit. Put the fruit in a food processor with about a half cup of water and pulse it a few times. Put the flank steak in a small casserole dish. Bathe the meat in the kiwi juice. Cover and refrigerate for a couple of hours. 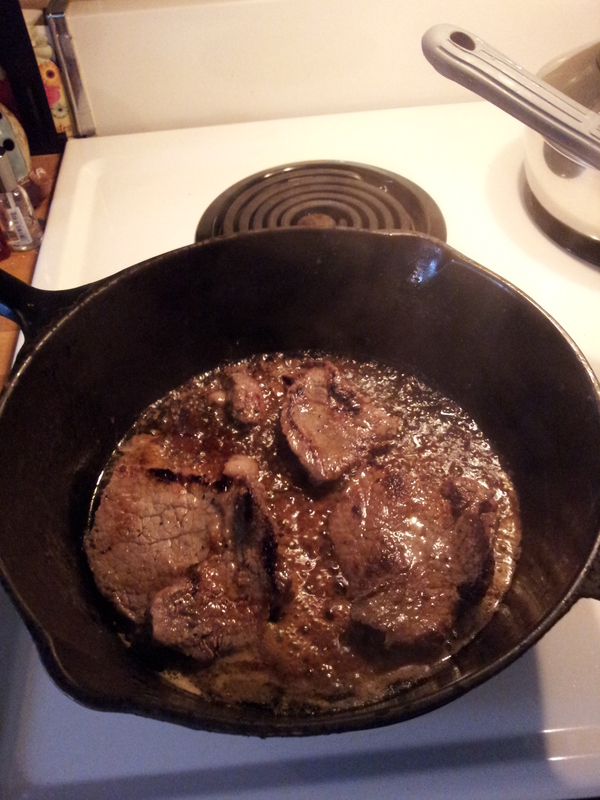 Then fry it in a skillet. Very tender!